San Francisco, CA — San Francisco Public Defender Jeff Adachi today released video showing a deputy public defender being unlawfully arrested outside a courtroom as she attempted to protect her client’s right to counsel. 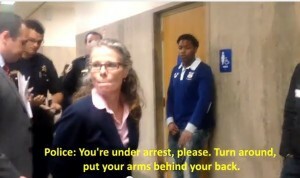 The cell phone footage, taken Tuesday afternoon inside the San Francisco’s Hall of Justice , shows San Francisco Police Inspector Brian Stansbury arresting Deputy Public Defender Jami Tillotson for refusing to let her client, a young African American man, be questioned without the presence of his attorney. Stansbury, the subject of a 2013 federal civil rights lawsuit filed by a black SFPD officer alleging racial profiling, cites Tillotson for resisting arrest as a uniformed officer places her in handcuffs. Tillotson, an 18-year veteran of the San Francisco Public Defender’s office, remains calm and courteous throughout the video, telling Stansbury and five officers that she is representing her client and is not resisting arrest. Officers took Tillotson to a holding cell in Southern Station, where she remained handcuffed to a wall for approximately an hour. After Tillotson was led away, Stansbury photographed and questioned her client and another young man who did not have an attorney present. Officers refused to tell the young men or Tillotson the reason for the detention. The Public Defender has requested a copy of the police report in the incident and has demanded both an explanation and an apology. Video of the incident can be found at http://bit.ly/18vHKXS or watch it below.